What a busy month! And on top of cleaning and decorating the house for all the Christmas festivities, I decided to make house shoes for one of my granddaughters, her daughter, and her daughter’s dolly to give them for Christmas. Found some sparkly turquoise fabric at Hobby Lobby that I knew they would love. I used home décor fabric-backed vinyl for the soles. They turned out great and were a hit especially with the 2-year-old. After completing the house shoes, I put buttons on the fly-away bells on the sleeves of a blouse I had bought. The sleeves kept getting into everything so had to tame them a bit. And I made a tea towel for my mom. There is a story behind it. Of course there is, you say! LOL I had made a tea towel a couple of years ago that my mom wanted, but it was my favorite, and I couldn’t part with it. And I didn’t have anymore of the fabric. But as luck would have it, I bought a box of scraps at a garage sale; and, lo and behold, there was a piece of that fabric in there! Woohoo! So now my mom has a tea towel exactly like mine. She’s a happy camper. For the past 6 months, my husband and I have been scouring thrift stores and garage sales looking for 11 x 14 frames to put my little sister’s artwork in that she was giving for Christmas gifts this year. She told me she had 9 pieces to frame. On Thanksgiving Day she told me she had 13. Okay, we are 4 frames short! So we went on a wild shopping spree searching for more frames. In case you are wondering why we are looking for them instead of her, it’s because she has autism. We help her out on such things when they prove too difficult or confusing to her. Some of the frames needed replacement glass which we found at a local lumber hard for half the cost of everybody else, and several needed mats which were purchased one per week at Hobby Lobby using the weekly 40% off coupon. Then we picked up her artwork, put everything together, and returned all to her so that she could wrap them. I watched as our other two sisters opened theirs on Christmas Eve. They went right to Kip and told her that these gifts are by far the best gift she had ever given them. Our mom and dad received theirs a few days earlier and called me to let me know how much they liked them and how much they appreciated us helping her. Thirteen gifts cost Kip only $34.21. We won’t count the gas, wear and tear on my car, or our time. LOL Here is the picture Kip gave to us. Somehow during preparing for having 20 plus people over on Christmas Eve and going on wild shopping sprees, I found time to work on a quilt. I had it more than half done by Christmas Eve and finished it a couple of days later. This was a fun experimental quilt. 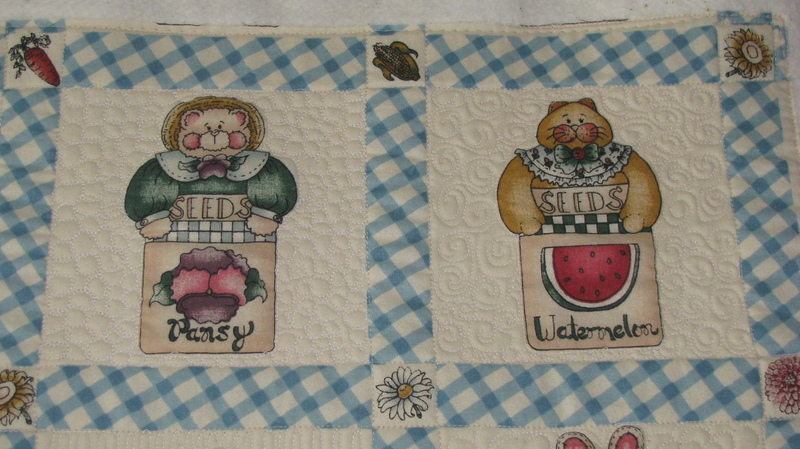 The plaids and stripes I used were cut from a number of men’s cotton shirts I purchased from the thrift store way back when I first started quilting. I feel this purchase requires a little explanation. 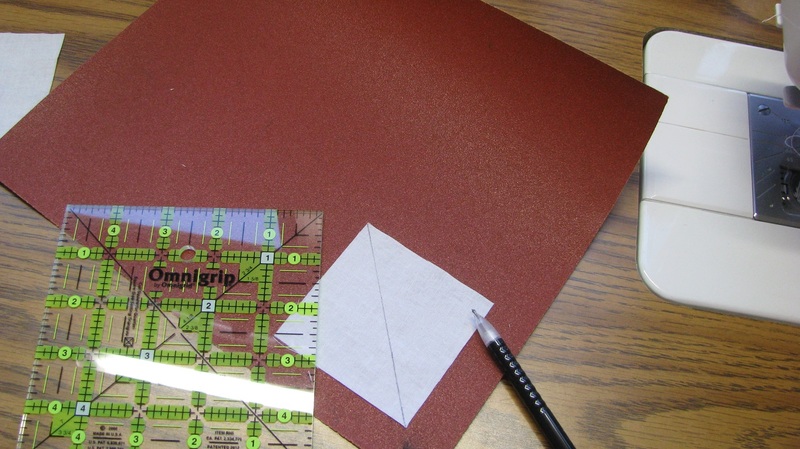 When I first started quilting, I was extremely short of funds. The thrift store would have $3 bag sales. I could fit a lot of cotton garments into that big brown paper grocery bag which gave me lots of fabric to play with. I’ve used pieces from this stash in a quilt for our grandson, a throw for a cousin whose wife passed away, and a doll quilt. I still had an overflowing tub that I needed to do something with. I certainly didn’t want to waste them so decided to cut all into 2 ½” strips and squares. Took a good while to do that but mission accomplished. Next step is to get all into warm quilts. Now back to the experimental part of the quilt. I loaded the backing and the batting for the quilt onto my longarm and then pieced long 2 ½” wide strips. As I finished a strip, I took it to the longarm and placed it horizontally across the frame and stitched it in place using my longarm. Bonus was sewing the strips together and quilting the quilt all in one seam. It really went quite fast and made a pretty nice quilt. See for yourself. But, really, I need to get back to making quad Log Cabin blocks. After all, I need 192 of these 4” blocks to make my quilt; and even though I started it in January, I only have 29 made. So during the month of December I added 3 more to that total and have determined that I will make 3 per week during 2018 and will assemble the quilt top in 2019. 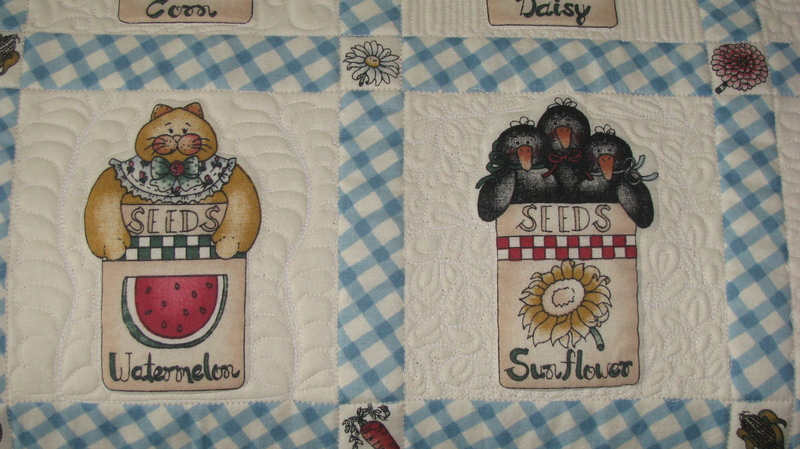 Oh, I almost hate to mention that there is a lot of appliqué on the border. This is a long-term project mainly because, although I really do like this quilt pattern, I find these blocks quite tedious to work on and each one takes so long to make! I figured out that in order to make one block, I actually make 5 blocks – 4 Log Cabins and 1 four-patch. So I will spread it out over time – a long time – and will eventually get it finished. To top off the month, I whipped together a baby quilt top. Started it at about 8:30 one evening, worked for a couple of hours, and got up the next morning and finished it. And, yes, I used some of the plaid from those shirts I cut up and the leftover backing fabric from the other quilt I finished this month. I need another 1 ¼ yards for the backing which I will pick up at Walmart next week. In the meantime, I’m waiting for the pantograph to come in that I am going to use for this one. It’s called Yippee Ki Yay! This quilt is destined to be the first one I finish in 2018. I didn’t accomplish nearly what I wanted to in April. Spring fever is my excuse. I just couldn’t resist going outdoors on those beautiful sunny mid-70s days. I just walked around checking out all the new leaves coming out on the trees and all the early flowers. But on the rainy and/or overcast gloomy days, I did sew. Thirty-six more Jacob’s Ladder blocks are now tucked neatly away with the previously completed ones. 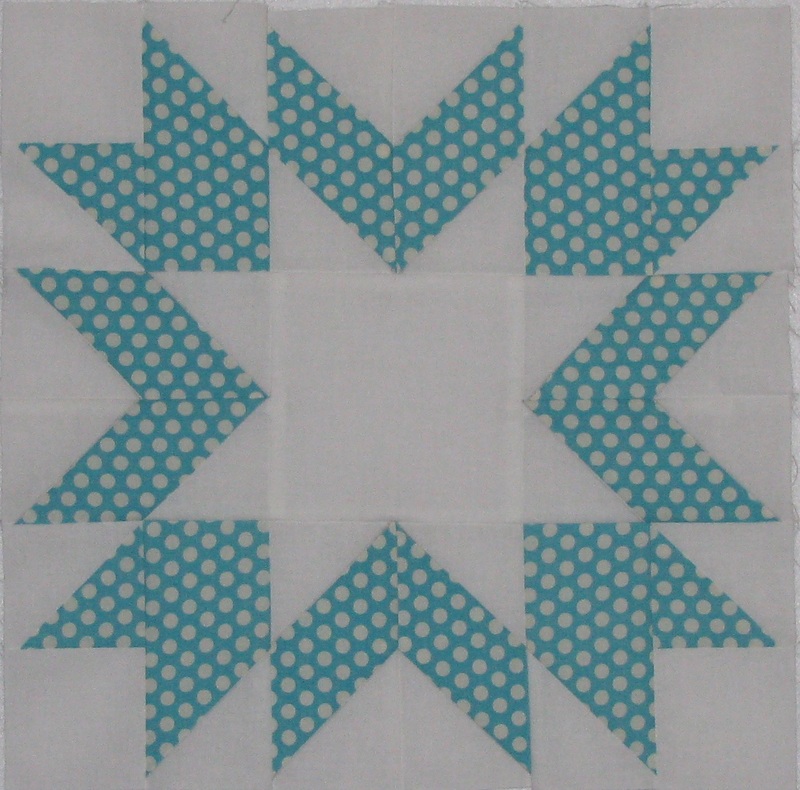 For those who are just tuning into my blog, I’m making 3 king-size Jacob’s Ladder quilts each of which require 72 blocks. It will take 6 months on the schedule I’ve set to complete enough blocks for them. I currently have a grand total of 144 blocks and only 72 to go. I did find time to make my sister some fabric baskets as an apartment-warming gift. She loves butterflies and purple, so these were perfect for her. She is already dropping loose change into the smallest one. I also repaired a blouse for her. It is black. I hate working on black because it is so hard to see your stitches on it. The hem had come out of one of the sleeves. The original hem had two rows of stitching. The fabric is slinky and stretchy. So I knew I would not be able to put two rows of stitching back in that sleeve and make it look good. So I removed the hem stitching in the other sleeve and hemmed both sleeves with a blind stitch. Took me longer to remove the stitching from that other sleeve than it did to hem both of them because it is so blasted hard to see black stitching on black fabric. Oh, I said that already. LOL I finally went outside in the sun so that I would have some brighter light. Well, it’s done and looks decent. I made my quota on the Jacob’s Ladder blocks with a week to spare so decided to put a quilt on the frame and get it quilted. I completed the quilting in 2 days. But this quilt top had problems. It was completed by someone that I don’t know back in the mid-60s and given to one of her children on May 25, 1965. I know this by some writing on one of the sashing pieces. It was hand-pieced and then washed causing it to fray. Some of the fabrics were loosely woven and frayed more than others causing some of the seams to open up. There are also some holes in some of the pieces. 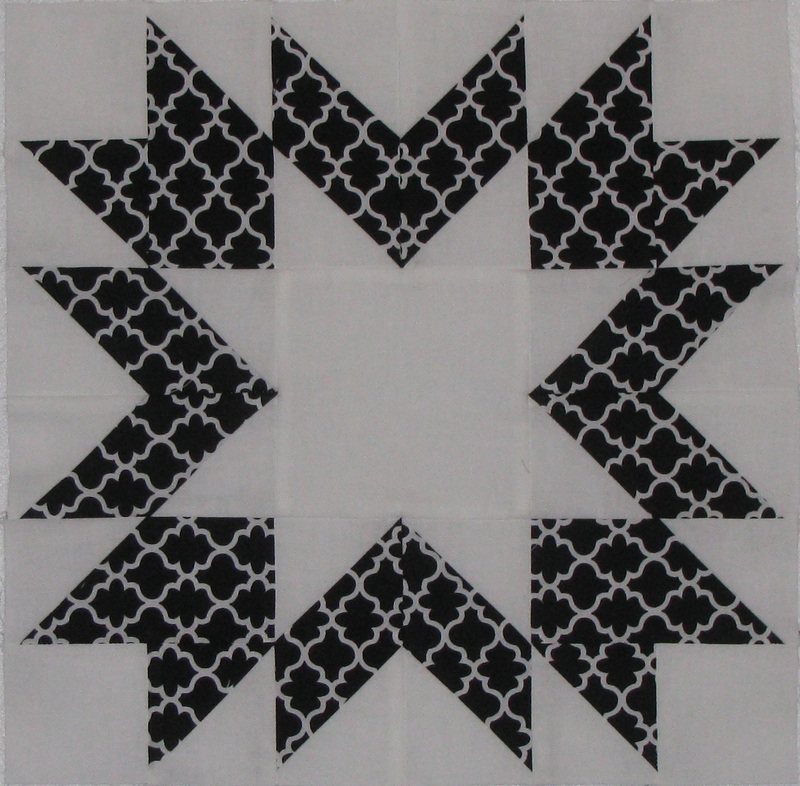 I knew that since I was quilting it using a pantograph that there would be some tucks and puckers here and there in the quilting. I don’t like holes and frayed seams and tucks and puckers. Now what am I going to do about it? Then it hit me. Appliques! I’ll cover the flaws with flowers!!! And I did it with my longarm. It was so simple and so much fun to do. I just cut the flower shapes and some roundish centers, stacked them on the quilted quilt where I wanted them and stitched away on the appliques not worrying about the raw edges. They will fray with time and washings, but they will not come off since I put so many rows of stitching around the edges. 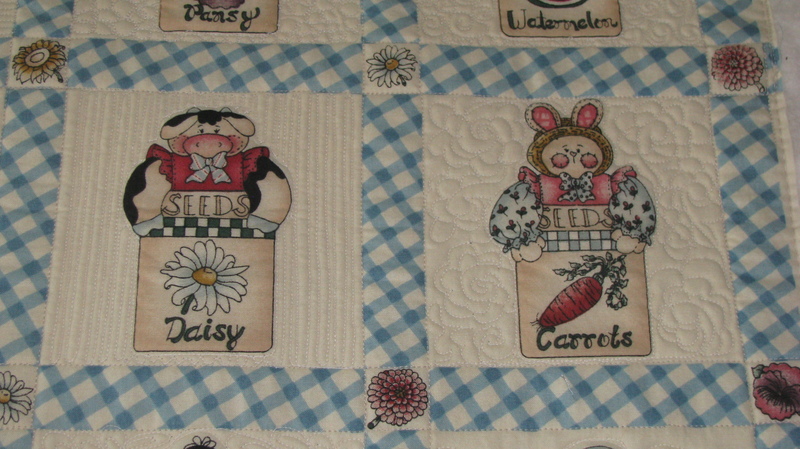 And I think they added a bit of whimsy to this vintage Bowtie quilt. Then another problem arose before I could get the binding on the quilt. We had hurricane force winds come through central Oklahoma which knocked down a lot of power poles which caused a power outage for almost the entire area, and, yes, we were one of them. I couldn’t iron the binding, and I couldn’t sew the binding. Or could I? No power; no problem. Out came the Singer 66 treadle machine my granddaughter gave me for my birthday one year. Did I know how to use it? No, but I could figure it out. I like to have worn myself plumb out winding the bobbin, but after a rest I managed to sew the ends of the binding together. Not bad, but how do I press this binding to finish preparing it to go on the quilt? I know. My Little Wooden Iron! I’ve had it for years but had never used it. It worked like a charm. Made a wonderful crease and didn’t take much longer than using an iron. I really got the hang of it. But I do have to say that I was glad the power came back on before I was ready to sew the binding to the other side of the quilt because there were just too many pins which would require a lot of stops and starts. The starts are the troublesome part as the machine sometimes wants to go backward instead of forward. That makes a bit of a mess with the stitching. Well, after all the challenges with this quilt, I’ve got plenty of memories, new skills, and a whimsical, bright and cheery new quilt. April may not have been one of my most productive months, but it certainly proved to be interesting. The High Tea Crochet Fusion quilt is still on hold. I’m continuing my exploration of different methods for joining the squares. Here is what it looked like last time I showed it to you, and it is still what it looks like. I finished sewing the X Marks the Spot quilt top. I didn’t have enough of the blue fabric to use exclusively for the backing and the binding, so I will be adding some of the cream and a left over block to piece a backing. The binding will also be pieced. I now have the Confetti quilt on the longarm and have quilted one pass. I wanted it to look rather old fashioned so am simply quilting 1/4 inch on each side of the sashing seam. I use the word simply rather loosely here since this quilting requires the use of a ruler to help me keep things going somewhat straight. 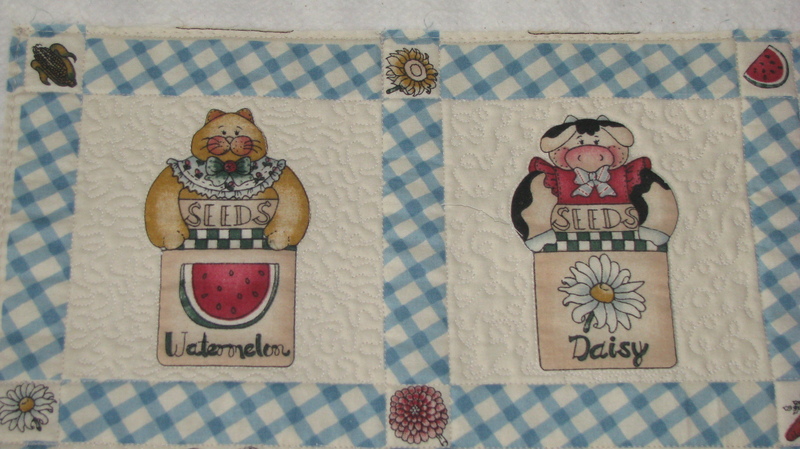 It’s not as bad as stitching in the ditch but is still considered custom quilting. I may wish I had used a pantograph by the time I’m finished as it would go much quicker. But I believe I am going to like the result.